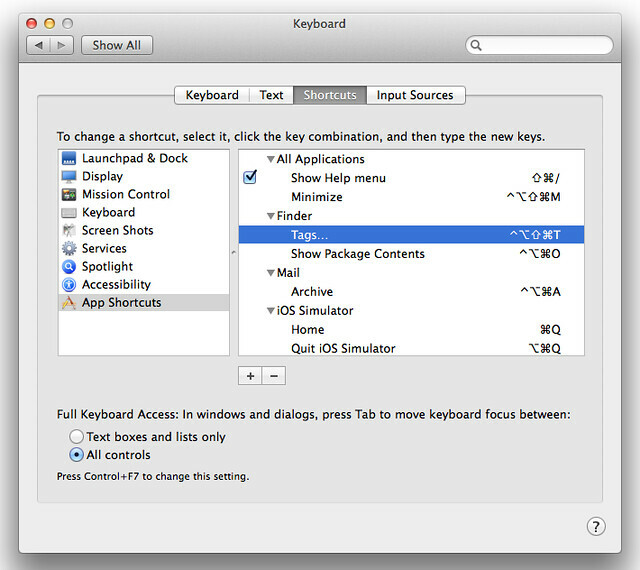 Mac OS X has a feature called tags, which were introduced in OS X 10.9 Mavericks. 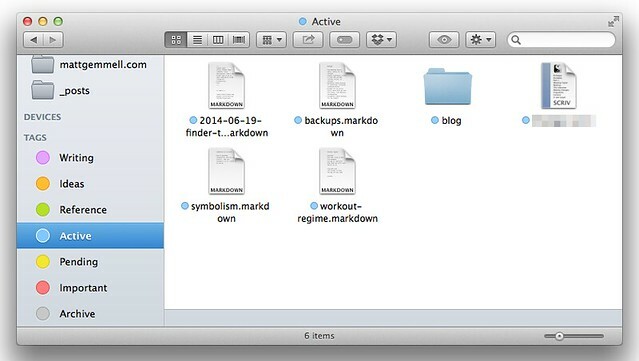 Tags are metadata that you can apply to files in the Finder. 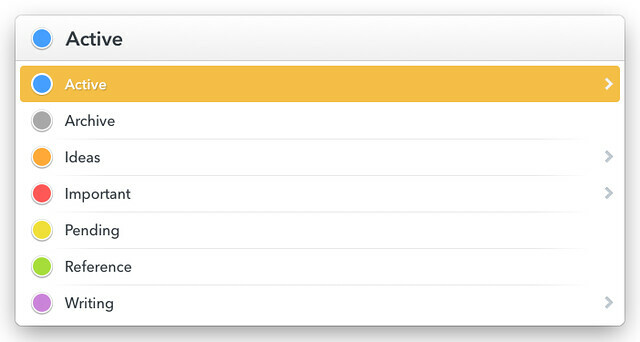 You can then search for files based on their tags, as well as their other properties and contents. I’ve always struggled to use tagging systems. My tendency is to over-apply tags, resulting in hundreds of different ones in use, barely providing more retrieval value than just searching by the file’s contents. Since everything is constantly indexed on modern operating systems, I see tags as more of an organisational and categorisation system. I’ve found a simple tagging system that seems to work for me, and I thought I’d share it with you. I don’t want to use tags in place of hierarchical folder organisation. I can’t get out of the habit of using folders and subfolders, and I’m not comfortable with the idea of using tags to partially replace that system. So, if I can express something about a file usefully by where it lives, I do that. 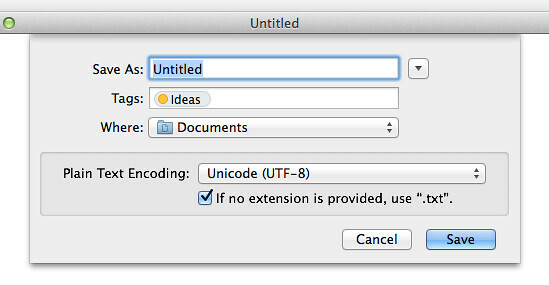 I don’t want to create tags that overlap anything that’s part of the file’s content or existing metadata. That seems redundant to me, and just another thing that I’d need to maintain. Spotlight’s indexing is excellent, and I’m happy to trust it to do its job. Tags come in seven colours (not counting the ‘no colour’ option). I wanted to use each colour exactly once, so that the colours would actually be meaningful in the Finder. If a colour has more than one meaning, I might as well not have that information visible at all. As with any categorisation system, I wanted to purposely limit the number of categories that any file would be in. One is ideal, and two is OK. Any more than that means I’m probably violating rules 1 or 2, above. I want the vast majority of my stuff not to have any tags at all, again so that the tags are actually meaningful. If my system requires tagging lots of files, I won’t use it. Life’s too short for that kind of housekeeping. Also, when I search for a given tag, I want the list of results to be as short as possible. Those all seem like common sense to me, but you may feel differently. This is just the way I personally use tags. I’m a writer, so the files I work on tend to be various kinds of text. They’re small in file-size, there are lots of them, and a project is often just a single text file. I have a number of clients, but not many at any one time. I have a few simultaneous projects on the go, but again not many: perhaps five to ten at most. Those are excellent quantities to deal with, because I can be completely aware of everything I’m working on without any confusion. I’m fortunate to have such a simple work situation. Having said that, I used a similar organisation scheme when I was making software instead, so maybe this can work for you too. I have a very small set of active projects. I have two other work-related types of documents that I need to be able to keep track of: ideas for future projects (very important for me), and reference material I’m working with. I only really have three states that a document can be in: currently being worked on, submitted and awaiting publication, and done. The last one doesn’t require a tag, because that would mean tagging lots of stuff. The second state is obviously important for invoicing and various other business reasons. I naturally keep absolutely everything, but some old files are more important than others. Besides the general ‘everything’ category, I have use for two others: important information that may be vital and/or irreplaceable, and stuff that should always be kept regardless of what my future self thinks when he’s having a tidy-up years from now. These two are wooly categories, but they work for me. The most significant factor was distinguishing between “just keep it around”, and “this is really important”. When everything is important, after all, nothing is. This all leads pretty naturally to a seven-tag system that’s split into three different categories. Writing is the tag that applies to most files, and it indicates that the file is some of my actual writing work. I can very quickly find just my own body of work with this tag. Ideas is my tag for a series of files that each contain ideas for possible future articles, stories and such. I have one in each appropriate folder of work: blog article ideas, short stories, magazine pieces for each publication, and even novels. When I’m brainstorming, I can very easily pull up my collection of ideas. Reference is used to mark reference material. It might be background reading, a brief, a page-layout for a magazine piece giving a sense of how the article will flow (and the all-important character counts per section), or even an extract from an email or chat-log where the work was discussed. I keep these files within their project, or within the general category of work (blog, stories, etc). Active marks my set of current projects: those I’m actually working on within the current two-week period or so. I find it very useful to be able to occasionally bounce between active projects for a change of pace, and to know what’s on my plate. I also use this tag to queue up ideas that I intend to write about in the next week or so: I transfer the idea to a file of its own, mark it Active, and get to it when I’m ready. Pending means a piece is finished (completely, after any requested edits), and has been submitted in its final form for publication. I review these whenever a new piece comes out, or every couple of weeks. I also tend to use this tag in the special case that a publication requires only a limited exclusivity period: I leave the piece marked as Pending during its exclusivity period, then remove the tag afterwards. I thus know which pieces are (or aren’t) available for republication elsewhere. 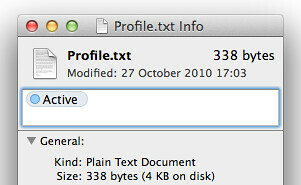 Important means that a file contains vital information that I want to be available at a glance. I find this useful because I often know what I want in terms of where it is and what project it belongs to, but my brain stalls trying to come up with a generic search to find it. It’s a tag that jumps out at you in a folder. I use it for things like government identification numbers, financial information, contracts and such. Archive is my “just keep this, even if it doesn’t look interesting anymore” tag. I use this for my copies of invoices, commissions, installers and uninstallers it seems wise to keep a local copy of, bank statements, and things of that sort. It means “if you must delete other stuff, at least don’t delete this”. That’s the entire system. I told you it was simple. I try to avoid using more than one tag, and my system is designed to avoid that situation wherever possible. There are a couple of potential exceptions. Writing and Active obviously come up a lot. Since active status is most important, I tend to mark the project folder with Writing, and the work file itself as Active. As above, but for Pending. Important or Archive could of course be combined with Reference. In practice, if a piece of reference material is no longer currently useful, I just remove that tag. There are many ways to apply and search for tags while you’re working. There’s a Tags button in the Finder’s toolbar, for example. You can also edit tags in a file’s Get Info window. Both of those are quite fiddly, though. I like to specify tags as soon as I first save a file, using the dedicated field in the standard Save sheet. It will autocomplete your tags, and show a drop-down menu so you can choose them. You’ll probably want to rename a tag, change its colour, or even delete it at some point. 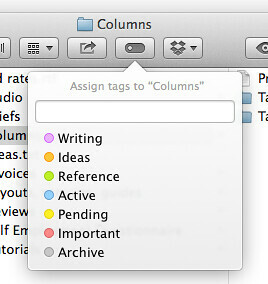 You can do all of that from the Tags tab in the Finder’s Preferences window. Just right-click on the tag you want to edit. You can choose which tags show in the Finder sidebar, and rearrange them by dragging. 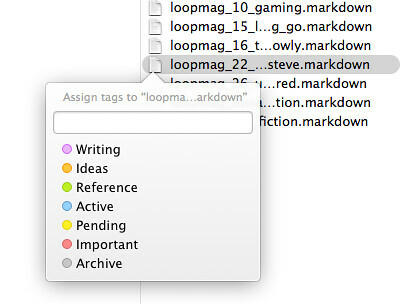 You can click any of those tags in the Finder sidebar to view a list of files that the given tag has been applied to. I sometimes want to apply tags to files after they’ve been created, such as when I change a file’s status. There’s a menu command in the Finder (“Tags…”, in the File menu), but I’m a keyboard shortcuts fan, so I used System Preferences to add a keyboard shortcut to that command. Go to the Keyboard pane, click the Shortcuts tab, then select App Shortcuts in the list. You’ll want to create an entry for the Finder, and type the “Tags…” command name exactly: it’s an ellipsis, not three periods, and you can type it with ⌥;. When you’ve done that, you can trigger the Tags popup by pressing your shortcut. Mine is ⌃⇧⌥⌘T, which I call quadruple-splat-T.
You can also search for files with your chosen tags by using your favourite application launcher. 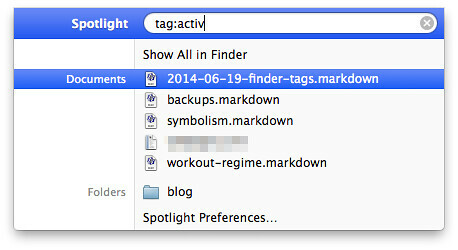 If you’re on regular old Spotlight, type “tag:” then immediately start typing the name of a tag. If you’re an Alfred fan, make sure you have version 2 or later, then type “tags “ following by the name of a tag. If you prefer LaunchBar, make sure you have version 6 or later, then type “tags” and select the tags option. Each listed tag hierarchically contains all relevant files. LaunchBar even lets you add and remove tags right from its interface. 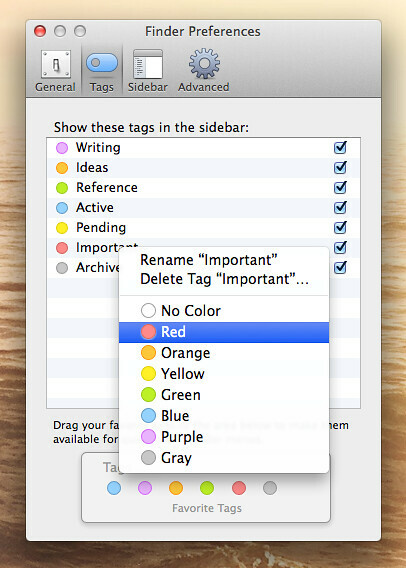 Tags are safe to use on multiple Macs. If you’re signed into the same iCloud account on both machines, your tags will be synced, including the sidebar order and colours. 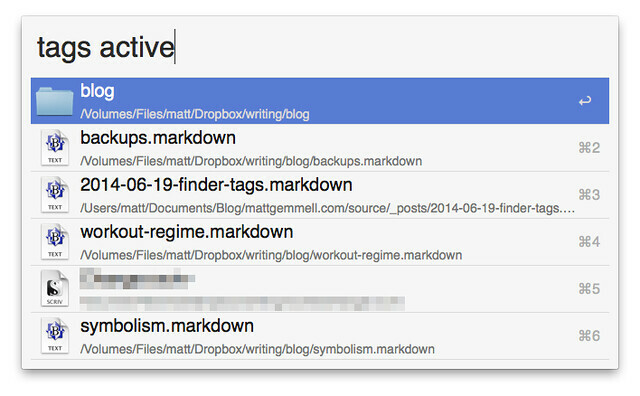 The tags attached to files are preserved too, including in Dropbox, which is extremely handy. It didn’t used to preserve tags, but it does now. That’s about it. There are many organisation systems available for use on modern Macs, and for some people, tags seem like an unnecessary complication. By being strict about how I use them, and realistic about what I want, I’ve found a system that isn’t burdensome to maintain and also helps with my workflow each week. I can’t ask for much more than that.